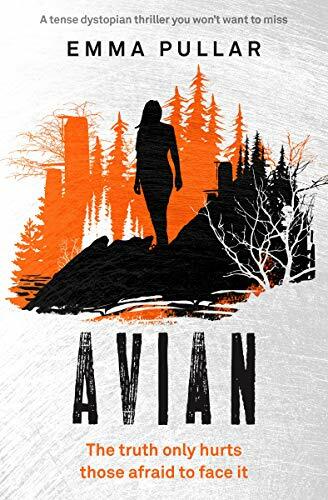 Ellen is taking part in the blog blitz for Avian by Emma Pullar today and I’ll be sharing her review with you all a little further down! Emma Pullar is a writer and book reviewer. Her picture book, Curly from Shirley, went to number four on the bestseller list and was named ‘best opening lines’ by NZ Post. As well as picture books, Emma writes online articles and speculative fiction. Her short horror story, London’s Crawling, which was published in the Dark Minds charity anthology, was a finalist for Twisted50 and shortlisted for the SJV Award. Emma has been writing dark tales since she was a little girl. The first picture book she wrote was called ‘Attack of the Killer Wheelie Bins’ and was about wheelie bins getting sick of people stuffing them with rubbish and so they started eating people! She then wrote a particularly disturbing story about two kids who fell down a pit and were eaten alive by a beast. It was graphic, her primary school teacher was concerned and called Emma’s parents in for a meeting. It was agreed that Emma had a wild imagination and no intervention was needed. Dystopian fiction has always been a favourite genre of mine and I couldn’t wait to get back into Skyla’s world in Avian. Skeletal is the first book in this series and I recommend reading it first although the author has done an excellent job in refreshing my memory of previous events which is important with this kind of book with SO much happening. As we rejoin Skyla she is still reeling over the events of Skeletal and is more determined than ever to break free of Gale City, the only problem is it seems everyone wants a piece of her! There is a reward for her capture and she is caught between a rock and a hard place (or Gale City and the desert), as well as looking out for her own safety she has the added complication of her companions Andia, Cara and Dove who aren’t the easiest people to look after. In desperation Skyla joins a gang which involves completing life threatening rituals of initiation. During these trials she encounters the Mutils – hands down the most disgusting, depraved creatures you will ever meet! Enough so that I coined the phrase #mankymantils at a certain chapter and that was my PG rating version. *shudders* I loved the introduction of some mysterious new characters in Avian who Skyla and friends encounter in the desert, with their appearance comes more illumination on the facts Skyla thought she knew. The Mutils aren’t the only abhorrent creatures you will meet in Avian, those flesh eating crows are back, there’s a Sand Kraken and some particulary vile Scrabs. Now I love this type of thing and the author’s descriptions really grabbed my imagination; I can totally see this series of books on the big screen….maybe not in 3D, even I have my limits. We are also reaquainted with Crow who has now become my new book boyfriend, his and Skyla’s friendship isn’t as straight forward as she’d like to believe and life is about to get a whole lot more complicated for the pair of them. Knowing the author I won’t hedge my bets on a happy ending, I’ve been burnt too many times. Avian features lies, deception, shocks, guts and gore. If you’re looking for a REALLY dark dystopian here it is and it’s definitely a firm favourite for one of my books of the year. I can’t wait to see what Emma Pullar thinks of next!